Mary O. 's Lunch Break (known as Mashiko's Lunch Break in PAL regions) is an Event Course in Super Mario Maker, released on March 9, 2016. It unlocks the Mary O. Mystery Mushroom costume upon completion. The level begins with an office-esque setting, along with a ? Block containing a Mystery Mushroom. 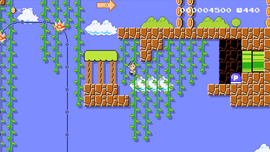 Afterwards, a segment appears with Koopa Paratroopas and beanstalks, leading to another segment where Mario must hit a P Switch to clear some Brick Blocks and enter a warp pipe. This leads to the Checkpoint Flag, along with a long segment involving a Fire Koopa Clown Car. It finally leads to a warp pipe, where Mario must continue across the Ice Blocks to a P Switch in a Lakitu's Cloud and the Goal Pole. This page was last edited on August 14, 2017, at 09:44.